It is no secret that cricket is the one religion that truly unifies in India. For generations, we have watched crowds throng outside electronic stores during a match, bunking work and school often to watch the likes of Sachin and Saurav take on the opposition. With time, the cricketing world came to our doorsteps, entering first in the form of cable networks dedicated to sports before slowly becoming a part of us with the dawn of the internet. But these are not without their flaws, mind you. The early days of dial up internet was a harrowing time if you were dependent on it for news updates. I still remember one eventful afternoon in March 2001. We were all students back then and you would have found us that day hovering around the college library. Of course, rest assured our eyes were not on any textbook. No, we were all gazing at the lone computer screen with internet access as the fan slowly rotated around above a dozen of us. You see, March 2001 may have had other significant events I am sure but for us cricket lovers, it was the beginning of a miracle. It was the second test in the Border Gavaskar series which we were already trailing 1-0 and having been forced to follow on, were staring at a humiliating loss. Obviously somebody forgot to hand over the script to VVS Lakshman and Rahul Dravid though. Nobody would have bet on what was to transpire during the final three days of that historic game as the duo did not just overturn the deficit but actually brought India to a position where Australia were set a target of 384 in a little over two sessions. After a sedate post lunch session, the magic began in the last session as wickets started to tumble dramatically on the turning minefield of a Kolkata pitch. Harbhajan wove his guiles around the Australian batsman, slowly but surely prying them out until only two wickets remained with nearly 20 overs to go. Once more there was a twist in the tail though. 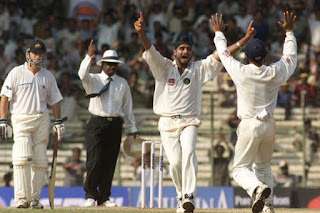 Having taken out the likes of Steve Waugh, Ponting, Gilchrist and Hayden in the span of five overs, suddenly we found ourselves unable to break through the defences of tailenders Kasprowicz and Gillespie. As over after over passed by, the frustration grew more and more intense. I remember all this a decade later because we as students stood there inside that college library, clicking the 'REFRESH' button over and over again as watched the dial up internet slowly twist and turn to deliver us the update of the next ball. As great as the tension was for the players out there, here inside the college, all of us were biting our nails too frustrated as much by the slow delivery of information as the lack of wickets. In the end, we did get those last two wickets in the dying overs of the day to win what many still consider one of the best tests of all time. No doubt the librarian must have wondered what subject could be so amazing that the students would scream and give each other high fives. The present generation is far luckier than we were in that regard. You have access to brilliant internet speeds today and even handier mobile devices that you can actually access the net with. From standing amidst a crowd outside television shops, in a single generation we have moved on to getting cricket scores from across the world at the touch of a button. And now, with sites like UC Browser that provide faster data transmission, you have dedicated sections like UC Cricket that combine lightening speed with the game India loves best. Now there is no need for clicking that REFRESH button like we had to years ago as the site has its own Live Score section that boasts both commentary as well as Auto Update facilities. They provide you with the latest news and even have videos so you truly cannot miss the best moments of cricket anymore. Today, cricket from across the globe truly is at your fingertips and you can find out the distance of Yuvraj's latest sixer moments after he has hit it, whether you are in a crowded bus or a business meeting. You no longer have to bunk from work or school, thanks to UC Cricket which ensures you don't miss a moment of the action.